It seems the chickens in these parts have been pulling the wool over our eyes. The Artist noticed Eli doing his "my lady just laid an egg" song and dance yesterday, while he was nowhere near the coop. After a little searching amid stacks of wood left after our summer storm, he found a secret nesting spot, with almost two dozen eggs squared away. This could be an indicator that we don't have enough nesting boxes. Well, we do, but no one seems to like laying in the top row of boxes, and if we keep replenishing our layers each spring, my idea to add another row of boxes for the girls should do the trick. Add another task to the list. On the bright side, I'll take this as a pretty good sign that we don't have any predators lurking about or this secret stash would be long gone. Not bad for a completely free ranging flock of two years. sneaky hens! cover blown by the proud rooster! And they say females talk too much! 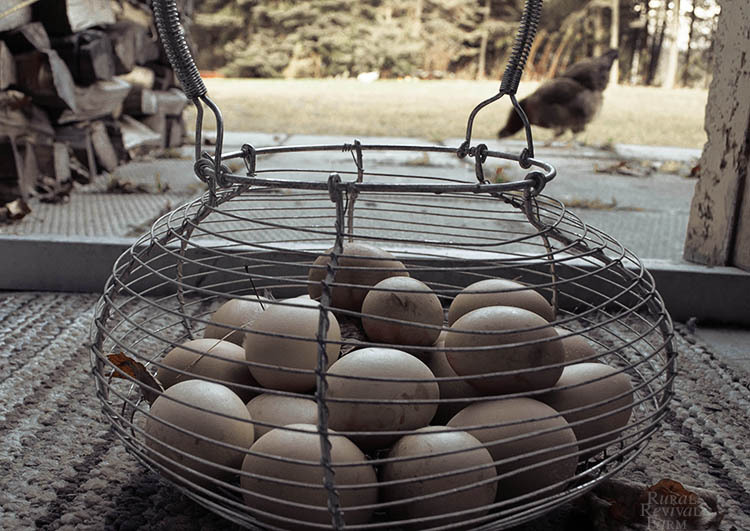 When we discovered the hens were laying elsewhere, we kept them cooped for just a couple of days. They got reacquainted with the whole nest box concept & we didn't have any more problems. silly gals :) I haven't had my hens lay outside, but they like to look for new spots in the coop...behind a bale of hay, under the chick brooder, in the middle of the floor! So true that it's a good sign you don't have predators!! Woo hoo for that! Good sign indeed . . . what are you cooking up? good news about no predators, but the rooster's gig for keeping secrets, well as far as the hens are concerned - it's ixnay on telling the rooster anything. That is definitely a good sign on the predators. Love that shot and the egg basket. When we had chickens we were always looking for their hiding spots!